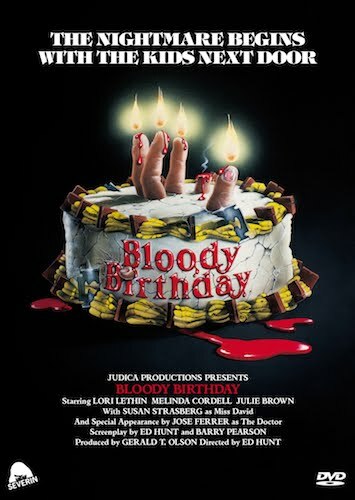 Two years ago, I did a post about some of my favorite “killer kid” horror films, the only reason 1981’s Bloody Birthday wasn’t on that list is because I hadn’t seen it. 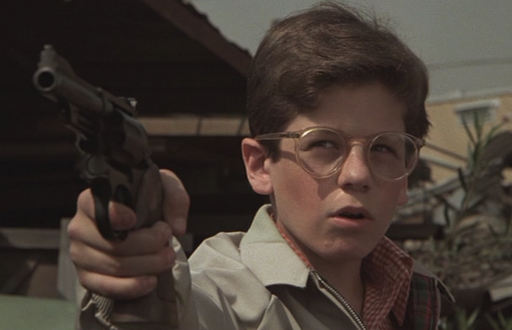 In fact, I didn’t even know it was an entry in the esteemed “murderous child” sub-genre. But the fine folks at Severin films have allowed me to set my facts straight. While the label has been courting classier and more high-profile projects as of late(The Stunt Man and Alejandro Jodorwsky’s avant-garde art-cult masterpiece Santa Sangre), their most recent crop of releases aims to explain to viewers that Severin has not gotten out of the cult horror re-release game. Three children (two boys, one girl), born at the same time, under the same evil astrological convergence, start killing on the eve of their tenth birthday. Classic. The strongest aspect of writer/director Ed Hunt’s Bloody Birthday, is that it quickly dispenses with the pretense that you are watching a proper film. Right away the malevolent tots are offing people, and the film’s breakneck pace only slows during its somewhat anti-climactic final moments. The film follows the prototypical (at the time) slasher formula of, if not upping the ante, at least varying the mode of death for each victim, leaving the viewer in awe of the trio of kids and their resourcefulness. Where the weighty and European Who Can Kill a Child? exploits its pint-size antagonists for maximum dread value, Bloody Birthday takes the more American (i.e. instant-gratification) route and frontloads the film’s more shocking moments, leaning on the “oh no, the child is pointing a gun at me” effect one too many times, until the result is camp. The final product is far more guilty fun than it should be and, as usual, Severin gives the movie an HD transfer befitting a film 10x its notoriety and merit. The protagonists never feel truly imperiled, but the gruesome fun of the first two acts (which include the dispatching of not one, but two pairs of young lovers, an 80s slasher staple) make up for the film’s shortcomings. Rounding out the disc is a lively interview with the film’s final girl Lori Lethin, a lengthy but rambling audio interview with Ed Hunt (interesting, but is also prime background noise for when you’re doing something else) and a “Brief History of Slasher Films” featurette, which is enjoyable but won’t tell you anything new if you’re already an aficionado. This is a recommended release , I can’t wait to pick up Severin’s other recent discs.